The 10′ x 8′ Traditional 8′ Cabin Shed offers pretty much everything that you could possibly want in a shed. It has an ideal amount of space inside it so that you can make use of this as a storage shed, workshop or even a little place to relax. The veranda makes for a lovely extra, but even without it, you get a very nice overhang that sets this shed apart from all the rest and certainly does give it a unique look. Four windows are included so there is always going to be plenty of light in the shed and to make getting in easy, a very well designed door has been used. While this is a shed that has been made so that it has a very attractive appearance, Treetops Traditional have also made sure to use materials which make this sturdy and long lasting. The shed is built around a very strong frame and the tongue and groove shiplap cladding will not allow any water into the shed. For the floor and the roof, tongue and groove boards have been used which go well with the design of the shed and also are just incredibly strong. 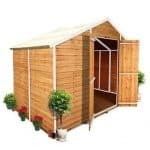 While the shed looks amazing and is very robust as it is, there are a number of extras that you can add to this shed. The 10′ x 8′ Traditional 8′ Cabin Shed is a very cleverly designed and good sized shed and while the one we are talking about is a little bigger than the one pictured the style is exactly the same. Inside here you are getting plenty of room to make use of with there being a very impressive, 10 feet of depth and 8 feet of width. 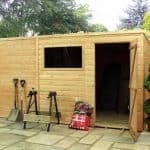 We always feel that a 10 x 8 shed offers just the right amount of storage space for the average person as it is a lot of room to make use of, but the shed is not so huge that it takes over your whole garden. The ridge height of the shed is 7 feet 5 which is a lot of headroom and the eaves are, 5 feet 6 inches which may sound low, but this is right in line with what other sheds offer. The apex roof on this shed is something we really like as it is different from the other ones Treetops Traditional use. It is made with 12 mm tongue and groove boards and then covered with felt, but what makes this different is that there is a lovely overhang no matter if you have the veranda or not. We feel that the awesome cladding that has been used on here gives the shed a very interesting appearance where it walks the fine line of looking like a shed and also looking like some kind of cabin. The cladding is 12 mm tongue and groove shiplap cladding which while clearly looking great also does a truly amazing job at not allowing rain into the shed. The frame inside the shed is the main reason you are going to be able to get 20 plus years out of this. It is an impressively thick, 44 mm x 27 mm frame which has those Treetops Traditional rounded edges that they love to use. One interesting thing is that they do say they can upgrade to a heavy duty frame, but to be honest the frame you get with it is more than strong enough so we recommend saving your money. Just like the roof, the floor makes use of those 12 mm tongue and groove boards. These are perfect for the floor as they can take a lot of weight, but they also feel solid under your feet so there is no need to tiptoe around the shed like you are taking part in some kind of ballet production. The robustness of this floor means that you can store a number of heavy things in here so for you folks with a lot of tools, power mower and other more heavy things, you are going to love this floor. All of the wood that makes up the, 10′ x 8′ Traditional 8′ Cabin Shed is high quality redwood and Treetops Traditional will give it a free basecoat treatment. However once the shed is built you will want to give it a good, full coating of wood treatment within the first few weeks. Also that wood as long as you give it a fresh coat once a year will stay looking smooth and stylish with no signs of rot. 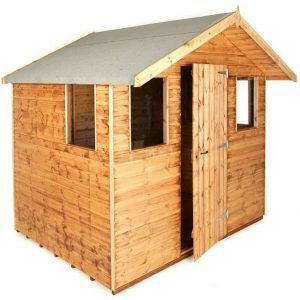 As is the case with all Treetops Traditional sheds a one year guarantee will be included to cover you in case of some issue such as rot. A 2 feet 6 inches wide and 5 feet 8 inches high door is what comes as standard. This is a lovely door that despite its very friendly and inviting appearance is solid due to its design and the fact heavy duty hinges have been used to attach it to the shed. If you need a bit more space to get in and out of the shed then there is the option to upgrade to a double door that is roughly 4 feet wide at a cost of, £53.99. The shed comes with four windows with two placed on the front and then one on each side. We really like how these windows are made with horticultural glass and because of the way they are placed you are always going to get plenty of natural light in the shed. If you would like the windows to actually open then for, £31.99 per window, you can make this happen. One thing about sheds from Treetops Traditional that we always like is how they include a lock and key as standard. None of this making you buy a padlock nonsense that you get with some other sheds. After a hard day gardening or even if you use this as a workshop and you have been making some cool things inside, you can lock this shed up securely when you are done. Any shed that has windows on three of its size is always going to be lacking in the privacy department, but that is not something we are going to put the shed down for. If you do want a bit of privacy or perhaps you just want to stop the sun getting in your eyes while you are in here working, then you can easily put in a set of blinds. Or if you want to really give yourself some privacy you can request that the shed be sent to you fully boarded with no windows at all. This is a shed where a lot of effort has gone into its design so there is not really anything you need to do to change the look of it. However one thing we will suggest is looking at the different colours of wood treatment that are available this way you can change the colour a bit and also protect the wood at the same time. 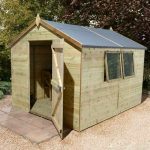 There are a number of extras that this shed has on offer, we already mentioned the door, windows and even the option of a heavy duty frame, but incredibly there are even more extras to consider. First of all we have an installation service where for, £104.99, Treetops Traditional will install the shed for you. A set of wooden floor bearers to help support the floor can be added at a cost of, £52.99. And of course the main thing you want to know about is that fantastic, veranda which is in the picture. We really wish this came with the shed as standard, but if you want this then you have to inquire about it when you order. 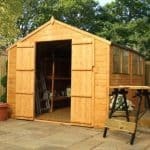 The quality of this shed is very high in every regard and we do not see anyone having any issues with the shed at all. This is a structure that was very cleverly planned so that it would last for many years. While the wood does need a little help from you in the form of a fresh coating of treatment once a year, we feel this is not a lot of effort considering how long you will get out of the shed by doing so. This is just a very nice amount of storage space which can be used for pretty much anything you can think of. 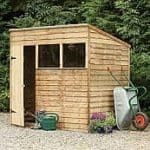 You are getting a lot of space, but not at the expense of having the shed take over your garden which larger sheds sometimes have a tendency to do. A set of instructions will be included with the shed and as long as you and the person you talk into helping, follow them properly then we do not see you having any problems building this. 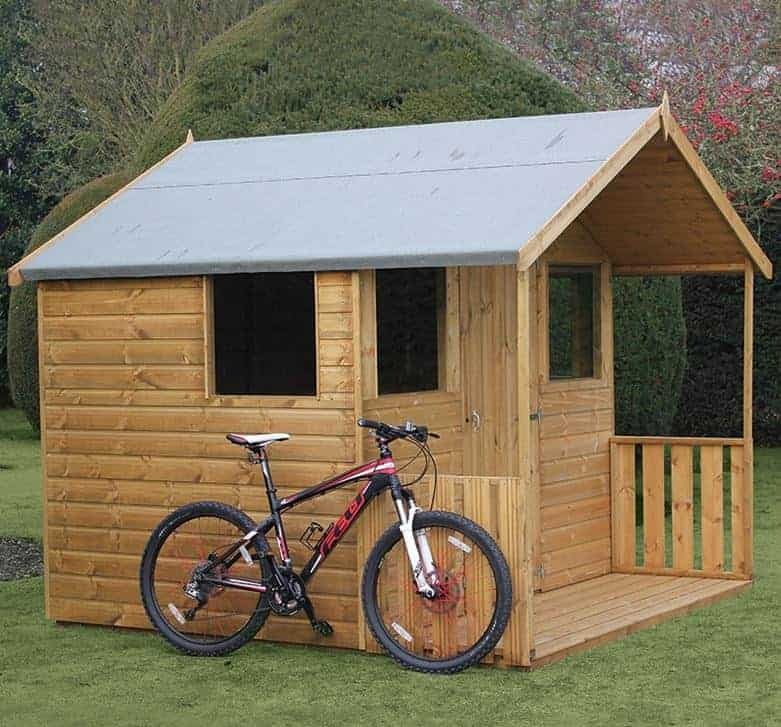 While this may be a little more expensive than some other similar sized sheds. You are paying that little bit extra for high quality materials which will last a long time so, yes this does offer very good value for money. Final Thoughts: Even if you do not bother with any of the extras that this shed offers and just get the standard, 10' x 8' Traditional 8' Cabin Shed, you will be getting one very impressive shed. It provides you with a very generous amount of storage space and the lovely design will make it look very charming as it sits in your garden. While we do wish the veranda was included as standard, we still do like the way the shed looks without it and are certain you are going to be very happy with this shed. 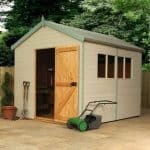 While the price may not be cheap, if this fits in your budget or even if you are happy to save up a bit longer then we highly recommend you consider this shed.